2-- I need to come up with something special to do with this last bit of sweet perfection. So I whipped up a rich chocolate cake, substituting lavender sugar for the granulated sugar, along with a batch of chocolate buttercream. When I assembled the cake, I spread a layer of the strawberry lavender preserves in the middle. 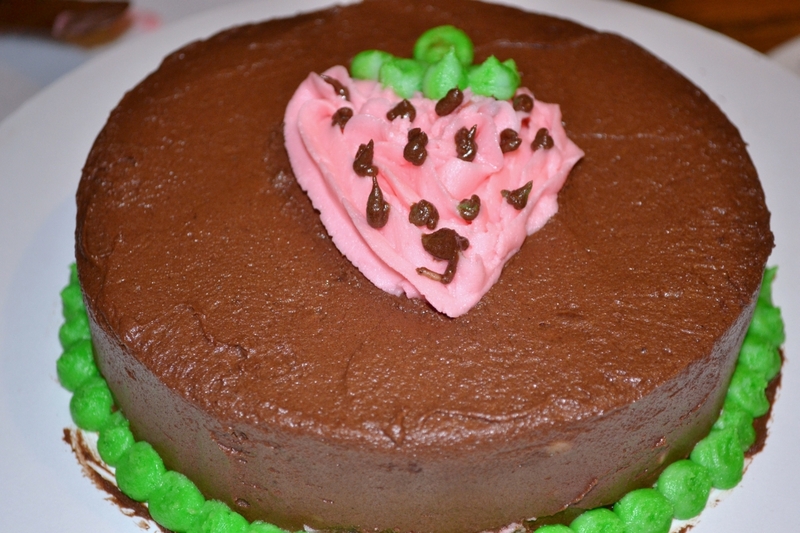 I piped a simple strawberry design on the top, and did a bright green beaded boarder at the edge of the cake board. Wash and hull strawberries and slice using an egg slicer. Combine the strawberries and the lavender sugar in a large pot and heat slowly until the juices become clear (4-6 minutes). Remove from the heat and stir in lemon juice. Bundle the lavender flowers into a square of cheesecloth and tie securely. Add the bundle to the strawberry mixture. Cover the pot loosely with plastic wrap let stand overnight. When you are ready to proceed, heat 2 or 3 ladles full of the strawberry mixture in a 10-inch nonstick skillet over medium-high heat. Cook and stir for 3 -5 minutes, or until the preserves pass one of the tests for reaching the gel state. Ladle the jam into the sterilized jars, filling to within 1/4 inch of the rim. Repeat with the remaining strawberry mixture. Process in boiling water canner for 5 minutes. If you want wore information on canning and are local to the Dallas Fort Worth Area, there is still pelnty of time to sign up for my Fundamentals of Canning class that I will be teaching out at The Universtiy of Texas at Arlington in early June. I love thrift stores. You never know what you are going to find. One of the stores I frequent often puts collections of similar items together in plastic bags. I picked up a bag the other day, and I thought it had cookie cutters in it. But I could see the word "Wilton" and the copyright date "1972" on the back of one, and since the bag was only $2, I bought it. There were cookie cutters in there: four Barney ones, to be precise. (As I don't have any toddlers in the house, those will be going up on Ebay, when I get a chance). But the Wilton things weren't cookie cutters. I wasn't sure what they were, but I had a guess, and when I put in the model number (408-91) on the back into Google, my guess was confirmed. I had picked up an entire set of vintage cake presses. Cake presses are neat, and couldn't be simpler to use. Once you have a base coat of frosting on your cake, you gently press the design onto the cake, creating an outline pattern, which you then trace over with thicker decorative frosting. You can use one design in the center of a round cake, four of the same design in the corners of a larger rectangular cake, or a repeating / alternating pattern around the side of a tall cake. Or use your imagination . . . These can also be used to press a design into fondant, uncooked sugar cookies, royal icing, etc. 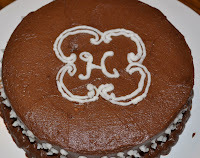 I was planning to visit an elderly friend, so I decided to make her a cake and use one of the presses to make a design surrounding her last initial.